Back in 2013, Dr. Lawrence Greenblatt was concerned about the rise of opioid prescribing in North Carolina. As medical director of Northern Piedmont Community Care, a Medicaid managed-care organization run by Duke Health in Durham, Greenblatt noticed a substantial increase in the number of patients who received opioid prescriptions and more reports of people overdosing from painkillers. Greenblatt's concerns were rooted in the data. More than 673 people in North Carolina died in 2012 from an opioid overdose, up from 300 in 2002. The issue in North Carolina reflects an epidemic that plagues the rest of the country. More than 15,000 people died in the U.S. in 2015 from a prescription drug overdose, according to the Centers for Disease Control and Prevention. When Greenblatt took his concerns to the medical safety committee of Duke Health, members agreed something needed to be done. “They put me in charge of fixing the problem,” he said. Greenblatt, along with a team of health professionals at Duke Health, implemented the Opioid Safety Committee to change how outpatient providers prescribe and discuss opioid medications with patients. “We were the first health system in the state to take a systematic approach,” Greenblatt said. Under their plan, Duke physicians are asked to inform patients receiving opioid prescriptions about the dangers associated with the drugs. Taking it a step further, Duke Health created an agreement in which patients pledge they won't seek opioid prescriptions from other providers, give the medication to anyone else such as a family member or friend, and agree to urine screenings at least every three months to monitor adherence and to detect use of illicit drugs. Patients will be cut off if they violate the parameters. In addition to the agreement, Duke Health created educational materials for patients to take home with them addressing the side effects and dangers of opioids when they are not taken properly. A YouTube channel was also created that includes testimonials from doctors who describe how to responsibly take opioids and the other options available to manage pain. Physicians are encouraged to check the state's prescription drug monitoring site before they order opioids to ensure their patients aren't already taking other painkillers prescribed by another provider. Doctors are also advised to prescribe painkillers in smaller quantities. Patients often receive bottles with 90 pills, even though the doctor only asked them to take about 20 over a certain period of time. Leftover pills can be misused by the patient or be handed out to family or friends, Greenblatt said. Despite physician concerns that opioid over-prescribing is a serious problem, Greenblatt admits it's been hard to get some doctors on board with the effort. Physicians often say they are already bogged down by a full roster of patients and other administrative burdens. “It's hard to think about adding this to their current workload,” he said. To encourage physicians to follow the guidelines, Greenblatt and others spend a lot of time educating the doctors about the program's importance for their patients' health and well-being. Practices with a high number of opioid prescriptions among the doctors are specifically targeted by Greenblatt and his team. They talk to them about how the program can be implemented in their daily practice. 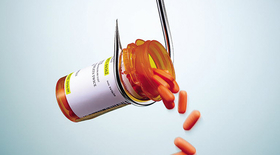 Talks are even held for those who are part of certain specialties that use painkillers more frequently-such as orthopedics or internal medicine-to encourage a more open dialogue. Greenblatt said doctors are engaged and ask lots of questions at these meetings. Since the program began, Duke has seen a steady decline in the number of opioids prescribed. Duke Health is now expanding the program from just outpatients to inpatients as well. Greenblatt said the efforts will focus on helping patients admitted to the hospital with a history of opioid use to treat chronic pain. He said those patients usually have more frequent readmissions and longer lengths of stay, so it's beneficial for the health system to manage the population better. “We are moving in the right direction and supporting clinicians to do the right thing,” Greenblatt said.